Minnesota where John Ackerman lives sit above limestone bedrock. "And where there is limestone, "he says, "there are caves. 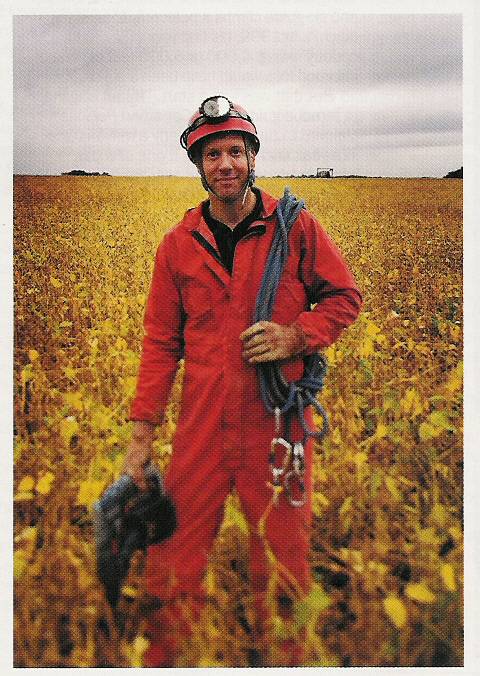 And what I'm good at - and known for in the caving community-is discovering caves." Generally speaking this involves finding a sinkhole, excavating it with a backhoe, and blasting a way in using explosives - methods that have elicited criticism from caving purists. "With John its quicker for him to blast in than find another way", says Blaze Cunningham, secretary of the Minnesota Speleoogical Survey. To be fair he adds, "there is a way of justifying some of it." Fair or not, there is no disputing Ackerman's passion for discovering and preserving caves. Since the early 1990s Ackerman, 51, has been buying up property in Fillmore County, where one small town, Fountain, Minnesota, bills itself as the "sinkhole capital of the world." Last year Ackerman opened the 27th cave on the 500 acres he now owns. "You never know when you open a cave just what you are going to find," he says. "I once found a raging river and, another time, a room big enough to hold a house." "One of my caves," Ackerman says with paternal pride, "goes for more than five miles; two-thirds of that is large passageways." And though he's had his share of close calls - Ackerman nearly drowned when a passage he was scuba diving became blocked - nothing has diminished the thrill of being first to enter a secret world that he, alone, discovered.